Virginia Street, once lined in vibrant and overwhelming neon, still glows. Just with less neon. The story of Neada has long been illustrated in vivid, electric neon. When traversing the vast deserts of the Silver State, glowing beacons radiate as oases of pleasure and respite in an otherwise desolate landscape. The vibrant rainbow ambiance emitted from neon has welcomed travelers and guests since the twenties and endures, somewhat, to present day. In the mid-century, when the rest of the country was abandoning neon for plastic signage, Nevada only doubled down on its neon structures and turned its efforts ablaze. That time brought about some of the tallest, most recognizable neon icons we still marvel at today. If there was no neon, you could be anywhere. But you’re in Nevada, and Nevada = Neon. However, neon is disappearing across the state, and when neon signs are still standing, they are often dilapidated or half-operational. The signs that once advertised heated pools, friendly bars and even courthouses and cemeteries, are dwindling. Some estimates suggest that Reno has lost about a dozen signs in just the last couple of years as developers raze old properties in the name of progress. Currently on Fourth Street in Reno, the Mardi Gras Motel came down and the Lido Inn is next in line as the Jacobs Entertainment’s project moves along. A bulldozer takes down another motel - and soon its sign - to make way for the upcoming project by Jacobs Entertainment. Jacobs retains the signs they have taken down, but no firm plan for their future has been released. Is the maverick, blazing craft out of date? Have styles changed to the point that neon is viewed as tacky, gawdy and in need of revamping? What is happening to neon in Nevada? Although tastes have evolved, and neon has lost some of its cultural sparkle, the future of neon is brighter than one might think and appreciation for the craft is on the upswing. More signs are being saved and treasured than once before. One Reno preservationist - who some call the 'guardian angel of the signs' - is capturing much of this architecture before it hits the landfill. Will Durham, Executive Director of The Nevada Neon Project, has some 100 signs from Elko to Vegas, Wells to Reno. He watches properties doomed for destruction, and then works with sign companies to safely remove the signs and nabs them before they’re lost. His nonprofit is planning a modern neon museum in Reno, which would bring the signs back to their full brilliance and show them off. “They’re not just these obsolete relics; they are, actually, artistically and historically significant,” Durham said. 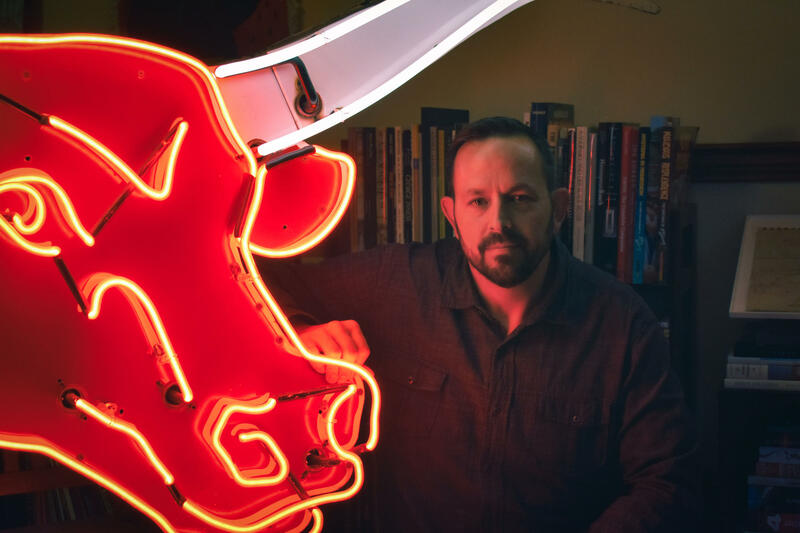 Will Durham, director of the Nevada Neon Project, has emassed a collection of 100 neon signs from across the state, with the hopes of exhibiting them in their lit glory in a modern museum in Reno. “People are intrigued by the neon story in Nevada, and there's room for that story to be told in different ways. The museum in Las Vegas, they do a wonderful job of telling the Las Vegas version of that story, but this is a big state and there’s a lot of different characters and different historical properties, and there's a lot more to be told. I think the story, to me, is a lot richer when you take in the whole state, and Reno had a real history. We had the largest casinos in the world for a long time; we were the entertainment capital, so this a nice way to honor Reno's history, as well." Historical buffs and preservationists in Reno are also watching the signs. Ideally, the signs and buildings attached would be preserved, still standing. ZoAnn Campana is the vice president of the board of directors of the Reno Historic Preservation Society. Although the signs are coming down in large numbers, there are also many efforts to bring the classic craft back into the spotlight. The University of Nevada, Reno has offered courses that focus on researching the neon pieces in the region, as well as the design and typography that go into these signs. A digital archive documenting and digitally preserving the history of the signs’ typography and design is also in the works. Professor Katherine Hepworth says the site she's working on with UNR History Professor Christopher Church and UNR Libraries will serve as an educational resource of what was once here, as well as chronicle the ongoing losses. Professor Katherine Hepworth works on her website, The Reno Type Archive, a site dedicated to digitally preserving neon signage. The Reno Type Archive will be a digital archive of Reno’s rich design history, based on the type, or font for a layperson, that has been used in the signs over time. Hepworth says the type tells the story of the changing economics and social makeup of the region, as well as the different groups that have used typefaces to convey their stories. These and other efforts will be an ongoing focus of our series, Sparked: Northern Nevada’s Neon through the month of April. Fifty-three Carson City artists are putting their work on a stage seen by millions a year, the walls of the Reno-Tahoe International Airport. Holly Hutchings has the story. Elko's 35th annual Cowboy Poetry Gathering wrapped up this weekend. Nearly 50 poets, musicians and musical groups, including diverse and dynamic new voices, have shared their artistry. The event is older than Josh Dugat, a first-time presenter, whose poetry pays homage to the boots that stood on stage before him. KUNR's Holly Hutchings has more with him.